Do you want to be a future filmmaker and videographer? You can begin filming today! Some students are born to make films and videos, others dream of it but don’t know how to start. The Film and Video program covers a variety of media productions, and the hardware, software and the equipment necessary for working in entertainment, or any business that uses film and video. Courses include training in concept design, screen writing, video production, television production, audio production, electronic computer imaging, editing and presentation technology. Students master the skills to create quality media productions for online, cable and television broadcast, DVD, and corporate video communications. 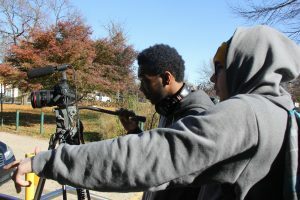 The Film and Video program enhances students’ computer literacy and communications skills, and provides students with a personal portfolio in preparation for college or employment right after graduation. Students in this program can obtain Adobe Certified Associate Certification in Premiere and Photoshop.